The aliens are most definitely here…. 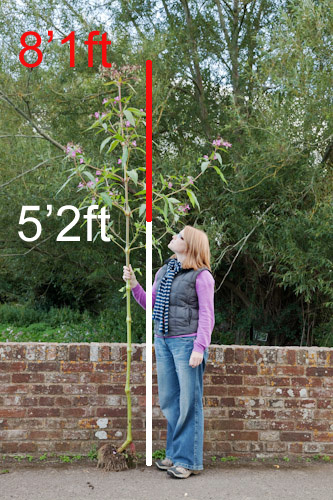 An attractive plant, principally associated with watercourses, Himalayan Balsam is the tallest annual plant in the country and can grow to an impressive 2m in height dwarfing both our native river bank flora and in this case, our glamourous assistant. It has large labiate-like flowers which give it one of its vernacular names “Policeman’s helmet”. The flowers range from near white to dark pink -purple. An unusual feature of this plant is the teardrop shaped seedpods which explode violently when ripe. Seeds are hurled at tremendous speed in all directions and are reputed to travel up to 7 m. The main, large-scale dispersal method is via watercourses and once in a river or stream the buoyant seeds enable the plant to rapidly colonise downstream sections. 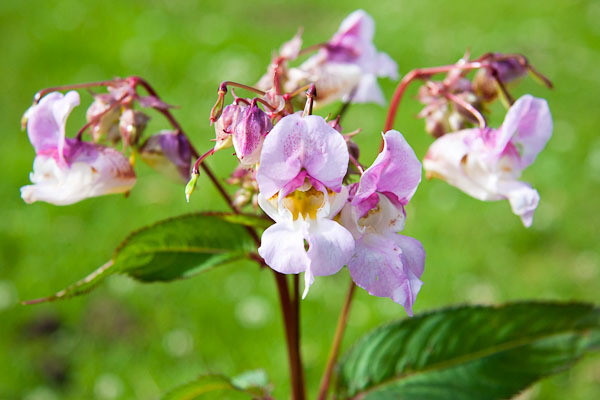 Favouring moist ground, large concentrations of Himalayan Balsam are rarely found far from water. The plant is capable of growing in very dense stands and with its tremendous vigour indigenous flora is easily outcompeted and overshadowed. Being an annual, the dieback in winter presents an additional problem particularly on river banks. The un-vegetated earth left behind is prone to erosion as water levels rise and this can lead to bank subsidence and instability. One point of contention with Himalayan Balsam is the popularity of the flowers with honey bees and some of our later flying bumble bees. Late in the season it is one of the most prolific of our flowering plants and the nectar rich flowers are a perfect fit for bees. The bees become so coated in cream coloured Balsam pollen that they often appear to have changed colour completely. Whilst the nectar is undoubtedly a convenient food source for the the bees, there is concern that native plants lose out once again since bees favour the abundant balsam flowers to such an extent that pollination of native species is very probably quite seriously reduced. Being a very shallow rooted annual, control can be achieved best by pulling the plant early in the season (before flowering takes place). 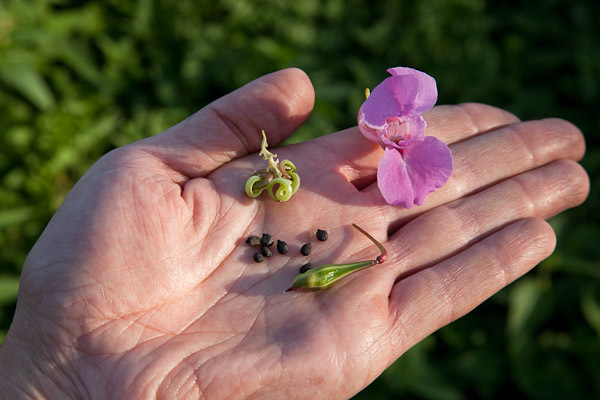 Once flowers appear, the plant quickly sets seed and removal is less effective since disturbing the plants will trigger seed dispersal. If seeds are present it is possible to reduce seed distribution by bagging the heads before pulling. However, this slows progress considerably and is not always particularly successful. Seeds remain viable for several years and so visits in successive seasons if necessary to eradicate balsam from affected areas. 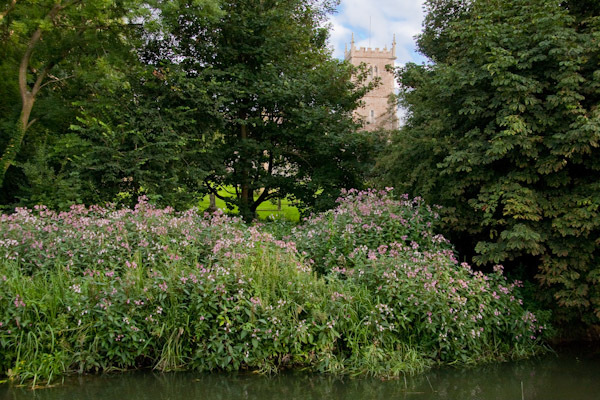 Wiltshire Wildlife Trust has an invasive plant team set up to deal with Himalayan Balsam and other invasive plant species. You can report sightings of pesky plants and also volunteer to go out on the pull with them in the spring and early summer. See their website for further information (http://bit.ly/a3C5WJ).